I can’t believe this is the first shrimp recipe on Ambitious Kitchen. Welcome, my shrimp lovers. 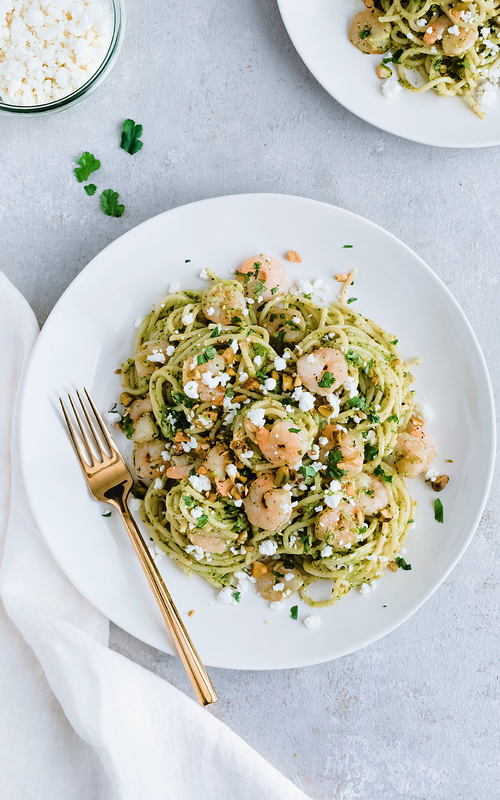 Today I’ve partnered up with ALDI to share a fabulous shrimp recipe you can impress just about anybody with: Cilantro Pistachio Pesto Shrimp Pasta. GUYS, IT’S SO GOOD and absolutely perfect for Valentine’s Day. 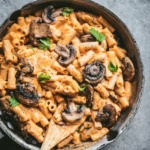 In fact, it’s one of those recipes that tastes like it belongs on a restaurant menu, which is exactly why I’m calling it my ‘Date Night In’ pasta. Make a side salad or my famous garlic bread recipe and get ready to have a cooking night in with your hunny. Or yourself. Whatever floats your boat sweetie pies. 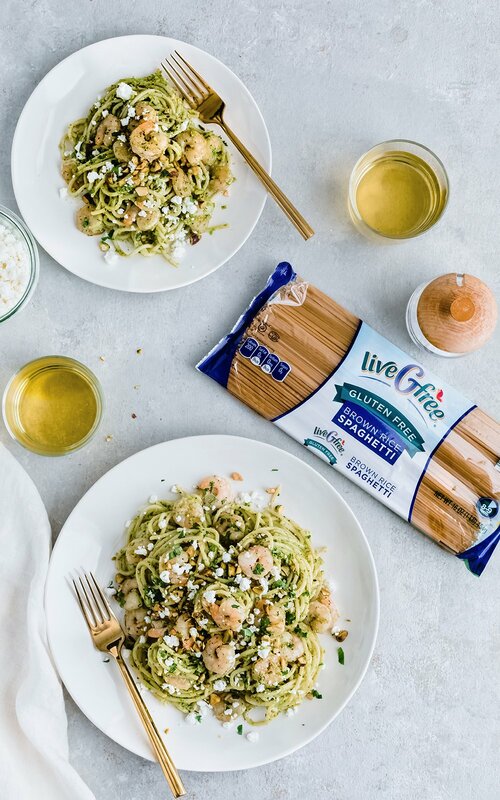 liveGfree Gluten Free Brown Rice Spaghetti from ALDI: an easy way to make this pasta gluten free! It tastes just like regular spaghetti and is perfect for serving to those who are gluten intolerant or have celiac. 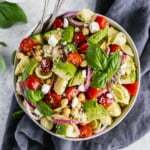 Cilantro Pistachio Pesto: wow, just wow! This pesto is beyond incredible and I’m convinced I need to start adding it or dipping just about everything in it (sweet potato fries, anyone?). The cilantro pistachio pesto is made with roasted pistachios, olive oil, fresh cilantro, jalapeño, garlic and lime juice. It has a little zip and a slight hint of jalapeño flavor and roasted pistachios. 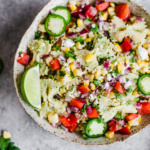 Fun fact: I first discovered my love of cilantro pesto last year when I made my street corn pasta salad. The cilantro pesto made the pasta incredibly fresh tasting and bright in flavor. This time I wanted to switch it up and use pistachios; the combination was an excellent choice. Shrimp: ALDI has a line of frozen shrimp that I like to use because it’s inexpensive, convenient, and high quality. The shrimp is already deveined and the tails are off, making it easy to throw into a pan without any prep. I don’t even defrost the shrimp; instead I throw them in a pan with a little olive oil, garlic powder and salt and pepper and cook until they just turn pink and opaque. Goat cheese crumbles: While this is optional, I LOVE the flavor it adds the pasta. You can either fold it in at the end or sprinkle on top of the pasta. DELICIOUS. I hope you all enjoy this ‘date night in’ pasta! 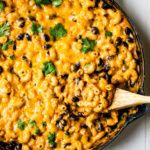 If you make it, please be sure to rate the recipe and leave a comment below. You can also tag #ambitiouskitchen on Instagram — I love seeing photos of what you make. 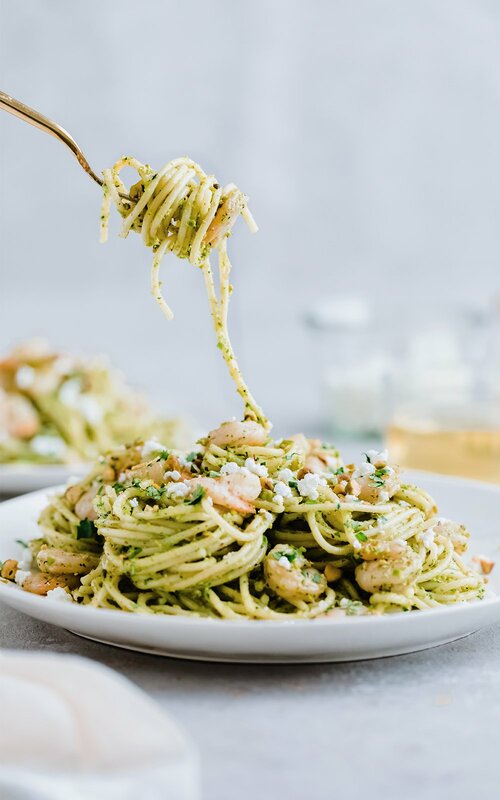 Make the pesto by adding the following to the bowl of a food processor: cilantro, pistachios, jalapeño, garlic cloves, lime juice, olive oil, water and salt and pepper. Process until smooth, scraping down the sides and processing again, if necessary. Next cook the shrimp: add olive oil to a large skillet or pan and place over medium high heat. Add in shrimp, garlic powder and salt and pepper; cook until shrimp is no longer pink. Remove from heat and set aside. Cook the pasta until al dente, according to the directions on the package. Drain pasta, then add back to pot. Stir in the pesto and shrimp until well coated. 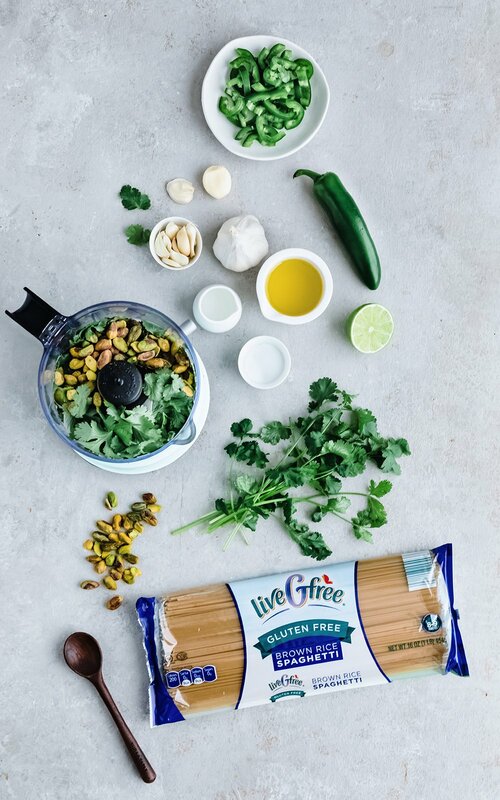 Add pasta to bowls and garnish with goat cheese, a few cilantro leaves and a sprinkle of crushed pistachios. Serve immediately. Makes about 4 servings. 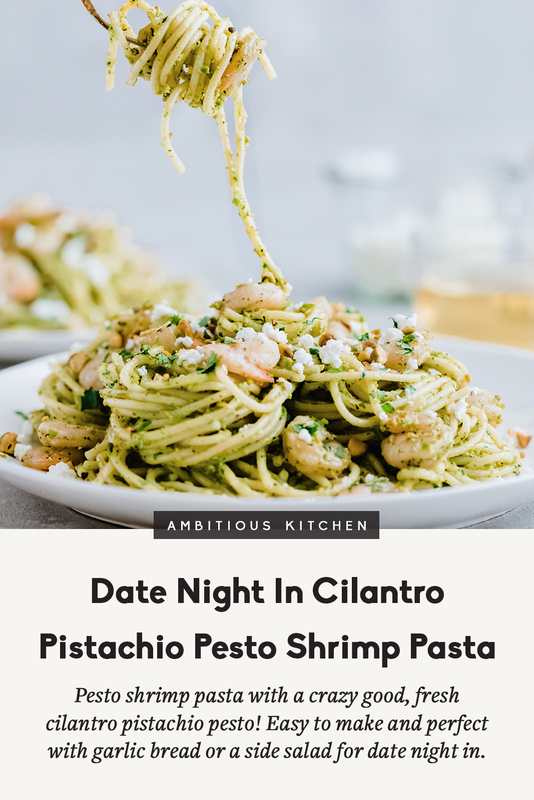 38 Responses to "Date Night In Cilantro Pistachio Pesto Shrimp Pasta"
That pesto sounds incredible! Yummy! Can you freeze the pesto? Sure! I think it would hold up well. Wow! 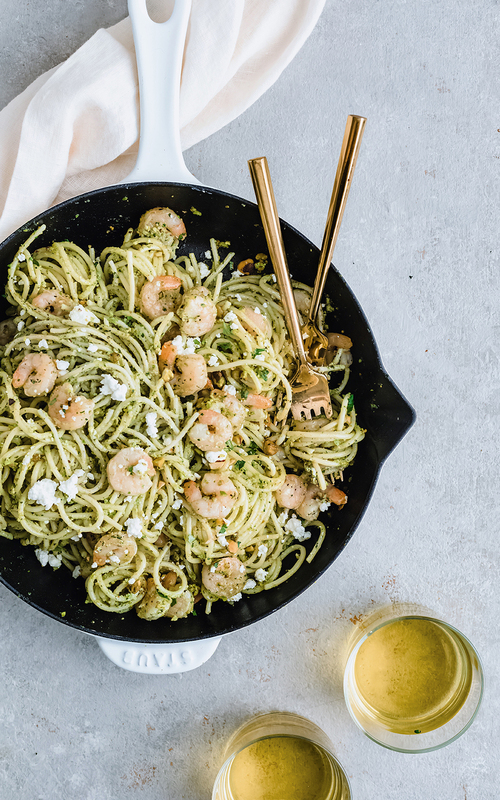 Such a great twist on pesto! Love the addition of goat cheese! Dang this is so. good. I added some blistered tomatoes, which did not disappoint. Whatever you do- do NOT skip the goat cheese. I could eat this every day! Love that idea!! And YES goat cheese is the best. Wow! It sounds yummi. 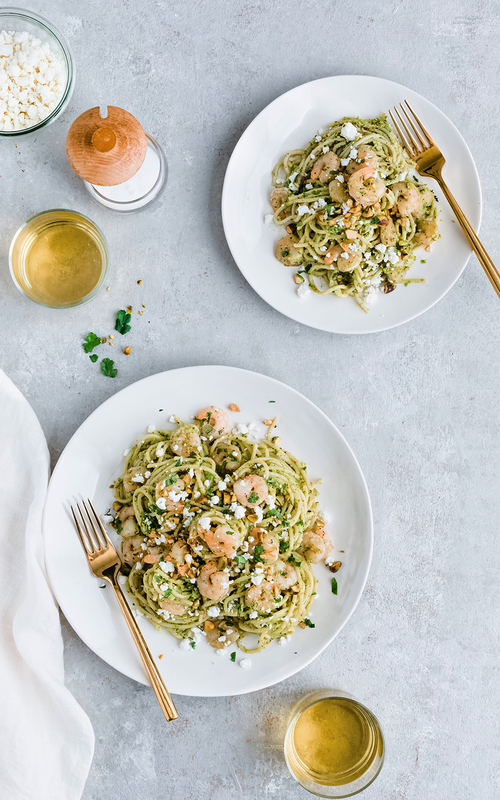 What do you think about replacing the pasta with spiralized zucchini? I don’t have a food processor. Can you use a blender? My girlfriend and I made this last week and it was amazing! We had everything in-house except for jalapeno and goat cheese so we subbed for a pinch of red chili flakes and fresh parm. Yum! Amazing! So glad you both loved it. Made this with chickpea pasta since my husband is a diabetic. We enjoyed it!! Perfect! And yes, feel free to add a bit more water to get the right consistency 🙂 Glad you enjoyed! This was GREAT!! And it’s easy to make! Who needs to eat out when you can make food this delicious at home? I did add more cilantro to get my pesto consistency to my liking. Thank you!! Absolutely! All about the extra cilantro, too 🙂 Glad you loved it! My husband and I made this tonight, and we both loved it! Felt like we were eating at a fancy restaurant, but for less than $4.50 per serving 🤗. I am glad I doubled the pesto recipe because we will definitely be making this again in the near future. This was the first recipe I have made of yours, and I will definitely be back to check out more. Thank you!!! This recipe is AMAZING. That pesto! My husband and I couldn’t get enough. Definitely going into the permanent rotation. Thank you for sharing this! I topped it with honey goat cheese which was a great compliment to all the deliciousness in the pesto. (I also put 5 cloves of garlic in the pesto, because it’s garlic 👍). This is a new fav, thank you again! Honey goat cheese sounds amazing in here! I’m all about extra garlic too 😉 Glad you both loved it! Hey Monique! I am thinking of trying this; however, my family has but allergies. What else could I use in place of the pistachios? Hi Lisa! 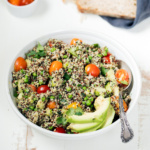 You could use pumpkin seeds or sunflower seeds instead. Enjoy! My boyfriend made this for our dinner last night and I could not stop raving how delicious it was. 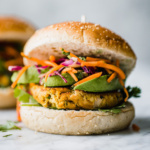 This is our 2nd recipe of yours that we’ve put into our dinner rotation of meals we make often (the first was your amazing roasted sweet potato and broccoli with mango-coconut rice buddha bowl – we make that about once a month) and we can’t wait to try out more. 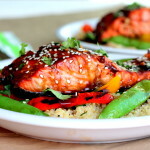 Next one to try is the salmon in a roasted red pepper sauce! Amazing! So glad you guys are finding delicious recipes here 🙂 more to come!